Director – John Frankenheimer, Screenplay – Ron Hutchinson & Richard Stanley, Based on the Novel by H.G. Wells, Producer – Edward R. Pressman, Photography – William A. Fraker, Music – Gary Chang, Visual Effects – Digital Domain (Supervisor – Michael Z. Hanan), Makeup Effects – Stan Winston, Production Design – Graham ‘Grace’ Walker. Production Company – New Line Cinema. UN peace negotiator Edward Douglas drifts at sea, the only survivor of a plane crash. He is rescued by a passing vessel and taken to an island. The island is the home of the brilliant geneticist Dr Moreau who has sought seclusion so that he can continue his work unimpeded by the animal rights movement. In his search for the perfect human form, Dr Moreau has genetically altered animals and transformed them into intelligent, upright human hybrids. Moreau acts as a god to his populace of beast people, controlling them with pain-inducing electronic implants. However, when one of the beast people discovers that the implants can be removed, rebellion starts. Critics are like political reporters – they love the smell of disaster or any sign of screw-up and human hubris that happened behind the scenes on a film. This remake of The Island of Dr Moreau came ladened with the smell of a disaster of epic proportions – from director Richard Stanley’s being removed from the helm by New Line management soon into shooting; to star Val Kilmer’s widely reported ego tantrums and notoriously well known difficulty on the set; to wild reports of Richard Stanley going bush and joining native activists to sneaking back on the set in disguise as one of the Beast People extras. It is hard not to read the stories – Richard Stanley made a particularly convincing argument for his own case in a two-part feature in Fangoria magazine – and to look at the independent evidence – the egotistical Val Kilmer, a badly overweight Marlon Brando, replacement director John Frankenheimer who has not made a decent film since the 1970s – and not see The Island of Dr Moreau 1996 as a crash waiting to happen. Every other critic did. 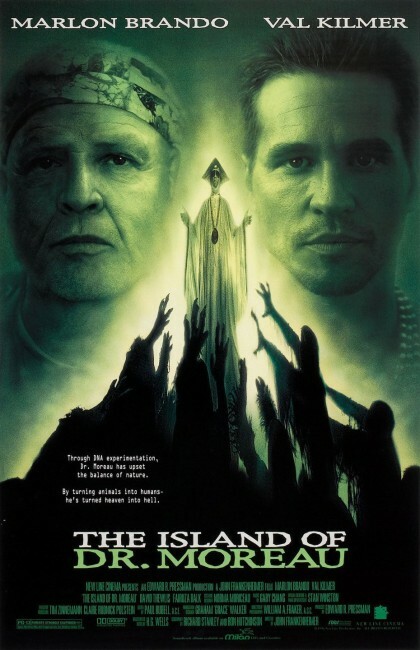 Eighteen years later, there was even a documentary made about what happened with Lost Soul: The Doomed Journey of Richard Stanley’s Island of Dr. Moreau (2014). The great surprise is that The Island of Dr Moreau 1996 is not the total disaster that everyone called it. In fact, there are times it is a rather good film. There is no question that Richard Stanley’s original vision for the film is a far more adventurous one but the one that we end up with here is not entirely bad. Some critics slammed this version for crudening the original H.G. Wells novel The Island of Dr Moreau (1896) – namely the removal of the House of Pain (although did not credit it for reworking the House of Pain theme as the embedded control circuits). The film is a reasonable run through the H.G. Wells story, even if it is adapted more from previous screen incarnations than it is from the book itself – in fact, one could almost call it a remake of the previous version The Island of Dr Moreau (1977) but conducted with more feeling and epic scope. John Frankenheimer does a decent job. The film moves well and is impressively photographed for the big screen. Frankenheimer directs some scenes particularly well – one of the finest of these is where the Beast People invade Moreau’s home and Moreau treats them like his children, ending in the powerful piece where the Hyena Man jumps up on the piano to proclaim the animal laws as good. Unlike the 1977 film, Frankenheimer uses the Beast People makeups well. (An exceptional job has been done on the makeups – they are genuine characters under their skins). The scenes of them surrounding David Thewlis grunting hold much threat. Unlike previous versions, John Frankenheimer extends the climactic overthrow by the Beast People out into much more of a dynamically scaled action movie climax – the images of the Beast People loose in Jeeps waving semi-automatic rifles are striking. Some of the scenes here are excellent – the Sayer of the Law’s decision to return to the jungle at the end gives the film a sad coda that none of the other versions have. The performances are a mixed bag. 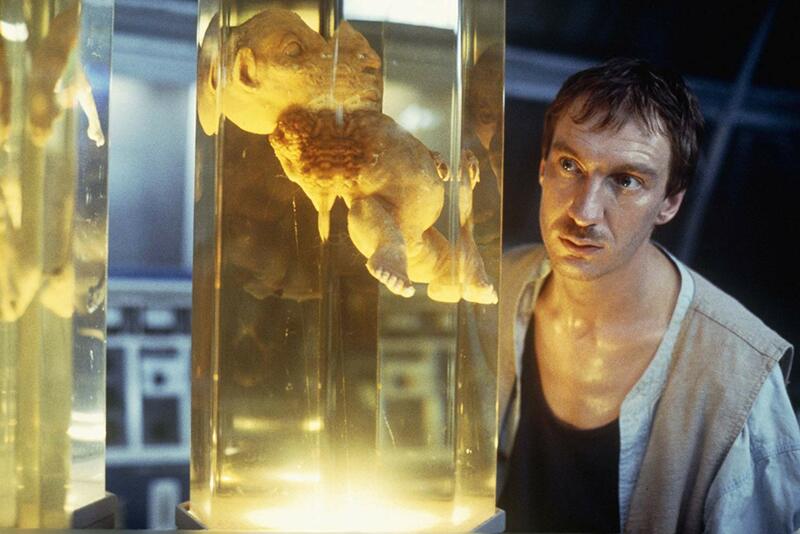 David Thewlis is okay but has an oddly off-putting tendency to enunciate as though he has a mouth full of marbles. Fairuza Balk plays a character that manages to be all of fragile, sensual and mysterious. Even the usually wooden Val Kilmer is fairly good in his cynically burned out part. Temuera Morrison’s contemptuous dog servant comes across well. However, the finest performance in the film is Daniel Rigney as the Hyena Man who allows the part to come alive with a real fire and power. The only actor in the show who does poorly is oddly enough the legendary Marlon Brando. 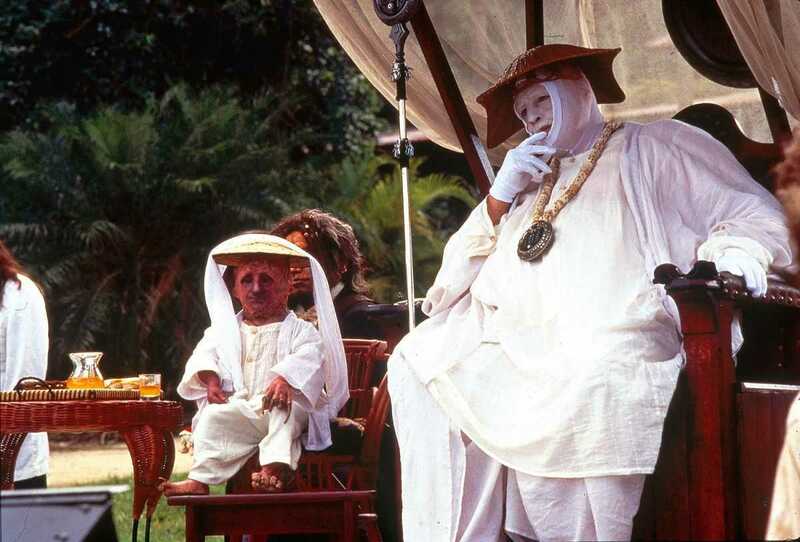 The role of Dr Moreau appears to have been deliberately tailored for Brando to play to his well-known eccentricity – he about the size of a blimp, decked out rather laughably in white robes and kabuki makeup. (Val Kilmer claims that Brando made his own costume out of mosquito netting). In one of the more bizarre scenes, Fairuza Balk tips a bowl of ice-cubes into a bucket Brando wears on his head – why who knows, the only answer would seem to be something to do with Brando’s wilful penchant for eccentricity. For all that, the character of Dr Moreau never comes alive. There is dialogue explaining Moreau’s motivation but Brando never enervates it, seems only to be wandering around in a confused daze. Equally, this could be another famous Marlon Brando eccentricity at play – the Brando who had trouble remembering his lines. 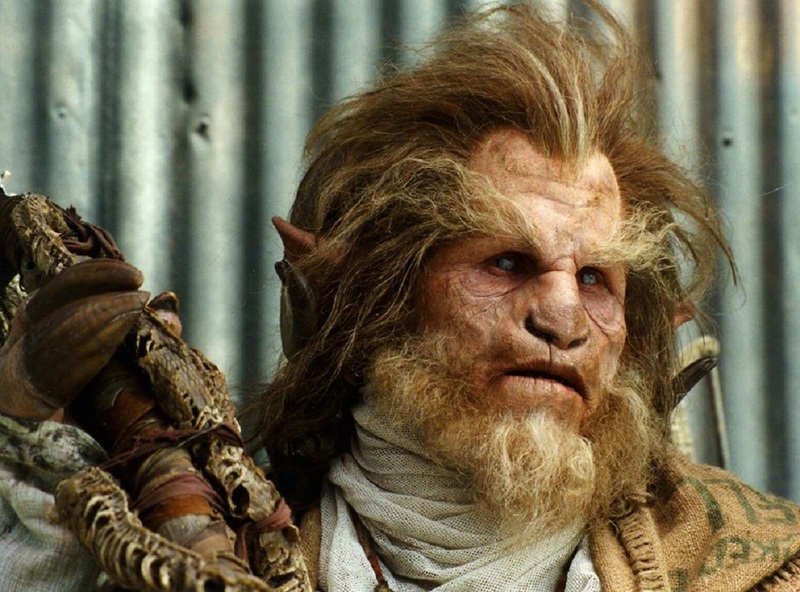 The Dr Moreau character here is also much weaker than in previous versions – in fact, has less screen time than either David Thewlis or Val Kilmer do. All that you see of Dr Moreau is not a brilliant geneticist but Marlon Brando indulging his eccentricity. Previous films versions of the H.G. Wells book are The Island of Lost Souls (1932) starring Charles Laughton as Dr Moreau, which still remains the definitive version, and the disappointing The Island of Dr Moreau (1977) with Burt Lancaster as Dr Moreau, as well as the uncredited Filipino-made Terror is a Man (1959) and the cheap Dr Moreau’s House of Pain (2004). John Frankenheimer’s other films of genre interest are the classic Cold War brainwashing black comedy The Manchurian Candidate (1962); Seven Days in May (1964), a political thriller about an armed coup to overthrow The President; the rejuvenation syndicate film Seconds (1966); and Prophecy (1979) about a mutant bear. Richard Stanley had previously made the excellent Cyberpunk film Hardware (1990) and the supernatural serial killer film Dust Devil (1992). (Winner in this site’s Top 10 Films of 1996 list. Nominee for Best Supporting Actor (Daniel Rigny), Best Cinematography and Best Makeup Effects at this site’s Best of 1996 Awards).